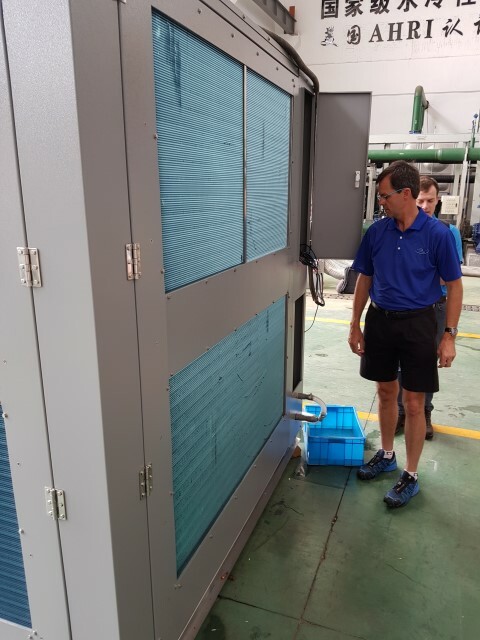 One of the hidden challenges of Evaporative cooling is dealing with a phenomenon called overcooling during very dry days. In summer we try to typically introduce air at 18 deg C into a building. This is normally achievable using Two Stage evaporative cooling, but some days, when the air is very dry, you can get excessive cooling when you switch the wetpacks on. This sudden drop in air temperature can produce supply air temperatures as low as 12 deg C.
The figure above shows that whenever the evaporative cooler goes through a state change, that you risk over cooling. In offices, this is problematic because the building is typically designed for a constant supply air temperature. 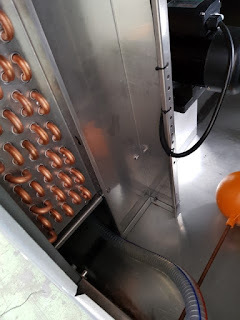 We now have a bypass damper that allows us to smooth overcooling so that after transition, we can mix filtered outside air with over cooled air in order to achieve a constant supply air temperature. With current power and water outages nationwide, more and more business have no regular access to municipal water and electricity supplies. This is forcing people to look at alternatives such as borehole water, which unfortunately typically contains lots of calcium and magnesium ions (hard water). During evaporation, the ionic concentration of water is increased to the point of deposition and these hard water salt deposits severely limit the lifetime of evaporative coolers, boilers, pipes etc. Uses electricity to precipitate ions in the softener, before they end up in your system. Only uses electricity (around 300 Watt) to reduce ionic content to below deposition levels. Uses no salts, resins or any other consumables. Is a sealed, low maintenance stainless steel unit with a long operation time. Is competitively priced to existing softener options. Initial results are very positive. Why does it makes sense to replace Single Stage Evaporative Coolers with Two/Three Stage Coolers? Typically, only 90% of the possible wet bulb depression can be reached, even with 300mm thick evaporative media. So for Tdb/Twb of 30/20 °C you can achieve a Tsa of 21 °C. The primary supply air fan can typically not handle any static pressure requirements, so the units must discharge air directly into the area to be cooled. The units therefore are placed on top of a roof, which makes monthly maintenance a major issue (so it doesn’t get done). The vertical discharge from the unit also means that any water carryover and leakage will be directly into the space to be cooled. The units are made from inexpensive composites and thermosetting plastic and have a limited lifetime in South Africa of around 5 years. Single Stage units results in very humid air in the building. This limites secondary evaporation, especially from humans. The ducting requirements are typically pretty extensive and you need a lot of air to achieve a specific amount of cooling. Two and Three Stage cooling on the other hand is a partial indirect evaporative process where water is cooled below wet bulb temperature using a cooling tower and dry cooling process. Benefits of Two and Three stage Cooling are:120 and 130% dry-wet bulb depression is possible. So for Tdb/Twb of 30/20 °C you can achieve a Tsa of 18 and 17 °C. The units are manufactured from Stainless Steel and have lifetimes in the order of 20 years or more. The primary fan is a high quality high efficiency Backward Curved EC plug fan designed for 200Pa external pressure so can be connected to ducting. The additional cost of the hardware is typically immediately offset by the reduction in unit size for the same amount of cooling. So a 16 m3/s Single Stage unit offers as much cooling as a 8 m3/s Two Stage unit and they cost the same. Ducting cost is significantly cheaper due to lower air volumes compared to Single Stage. Units typically are placed on ground level and discharge horizontally so they are easy to maintain and no risk of product damage from leakage or water carryover. The final humidity in the room is typically around 60% RH compared to above 80% RH for Single Stage. Evaporative cooling today is mostly done with industrial machines where water is evaporated into the air, in a paper pack. This process is more robust than traditional nozzle sprays because blockage and fowling is less of a concern and the process is a very efficient (you can typically evaporate about 90-95% of the maximum amount of water possible, in a pack that is 300mm thick). In Single Stage, water is evaporated into the air being pumped into a building. This means that for ambient conditions of 30 °C dry-bulb and 20 °C wet-bulb, can achieve a supply air temperature of 22 °C. Rooms are typically designed to be below 24 °C , RH (Relative Humidity) 60% and if you have a supply temperature of 22 °C, you can do very little cooling before the air is too hot to use. With Two Stage cooling, the air stream is split into a primary and secondary air stream. All water is the paper pack is now cooled in the secondary stream (cooling tower) and that very humid air is discarded. The primary air stream is dry cooled in a 6 row heat exchanger and now supply air temperatures of 18 °C is possible for ambient conditions of 30/20 °C dry-bulb/wet-bulb. 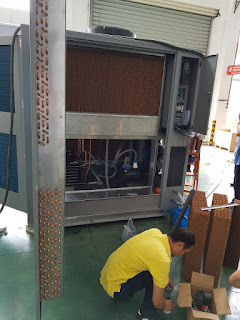 Three Stage cooling is a technical refinement of Two Stage cooling where the cooling tower water pack is disconnected from the primary air cooling pack. The result is that you can lower the supply air temperature by another 1 °C ( so now you can supply at 17 °C with 30/20 °C dry-bulb/wet-bulb conditions). This improved performance comes at a slight increase in cost as you now have more heat exchanger area, pumps and two sumps to maintain. 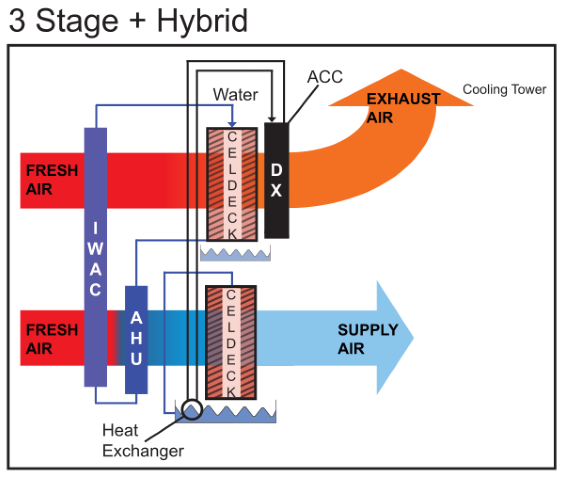 What is Three Stage Evaporative Cooling? 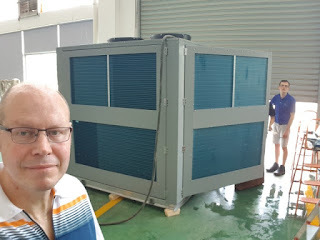 Toon Herman recently proposed an improvement on our Two Stage evaporative cooling process that would result in a supply air dropping by another 1 deg C.
The process splits the sumps between our primary and secondary air sections. Up to 7 steps of cooling/heating. This allows for a very flexible and cost effective control strategy because there are so many control options. Low supply air temperatures. The unit can now approach dewpoint much more closely because of the lack of air reheat in the primary water pack (exposure of our primary circuit to the conditions in the cooling tower). A complete integrated design. Compressors are located inside the unit and the outdoor coil, located efficiently in a cooling tower with improved oncoil conditions. Compact footprint. The air intakes are now on three sides of the unit, making the unit very compact to install. Modular design with hinging doors. Two of the side panels now conveniently hinge open, thereby simplifying the maintenance of the unit. Most importantly for our customers, our units have been reduced to two configurations: A 6.5 m^3/s and a 3.25 m^3/s configuration. The main benefit of this commoditization is an effective reduction in cost of about 20% per m^3/s (or kW cooling) of the units. Ecoaire and Protek built the first version of this unit in August in China. Integrated dome compressors and outdoor coil. 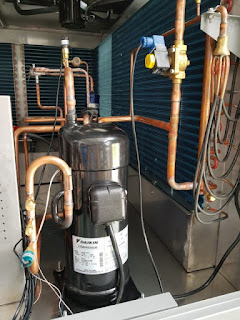 No more connecting pipes and gassing between indoor and outdoor units. Normal air-conditioning is primarily driven by a building design, solar radiation and then lastly by the local climate (cloud cover etc) at a specific location. Evaporative cooling is additionally also dependent on the humidity at a location. Most consultancies approach this problem by selecting a design day, something that broadly corresponds to a day when it is very hot and pretty humid. You cannot select the worse day of the year to size your air conditioner because this will result in a very expensive oversized solution. It is normal practice to accept that you will be 1 or 2 °C over specification for up to 40 hours a year (5 days a year). The design day approach is problematic in that it can easily result in an over design. Imagine a location that is pretty cold but have a very hot summer month (high altitudes)? Ok, so you over designed the solution by 20%. No biggie. But when you try and work out the operating cost of this solution, knowing the exact daily/hourly temperature distribution is very important. ProtekCooling has developed a simulation package that will simulate the performance of your evaporative cooler for historical temperature and humidity data. So now, for the first time, you can get an idea of how much it would have cost to operate a DX only system vs. an evaporative cooler. A major complaint against evaporative cooling is that what you save in electricity, you lose in paying for water. It turns out that the total cost of water consumption for an evaporative cooler per year, even at elevated rates, is only a 1/5 of the cost of electricity for the year. When you look at your electricity savings, typically 50% of the comparable cost of DX electricity, then the water cost less than 1/5 of the savings you make in electricity. In many of the locations for industrial cooling, the annual rainfall exceeds the water consumption requirements. So by collecting rain water, which is Ph neutral and relatively easy to use in evaporative cooling, you can remove your dependency on external water supplies. Here are the results for a real world application. It is a new mall in Transvaal, with approx 20000 m^2 floor space (15 000m^2 under evaporative cooling). The client required 220 m^3/s of Two Stage air to condition the mall to 24 °C. To do the whole mall with DX, would have resulted in operating costs of approx R1,100,000 per year. Moving to Two Stage Evaporative cooling, reduced that cost to about R500,000, less than 50% of DX. Rainfall in this region is in the order of 600mm per year. Collected from the roofs of 20 000m^2, this would provide 12 kL of water per year at zero cost (you have to pay for the storage tanks). The units in this simulation consumed 4 kL per annum. The total cost of operation for Two Stage cooling is about R610,000 per year compared to R1,100,000 for DX. This is about 55% of the DX installation. If the Evaporative Coolers are assumed to have cost R8,000,000 capital layout, assuming the cost of electricity stays constant, the whole plant would have been paid off after 16 years. Note that this is not the payback time (which is the time it requires to pay for the additional cost of evaporative cooling vs DX) because the capital costs for both plants are about the same. This means that after 16 years, you could have paid for the complete evaporative cooling plant from the operational savings compared to a DX plant. The number of hours that the unit would be above specification (24 deg C) and how much it would be over specification. The unit supply air temperature vs ambient conditions. The red and purple lines are the ones that show the supply air temperature for single and two stage units. The energy consumption of the different types of units. It is clearly visible that nearly at all temperatures, the evaporative cooler requires significantly less energy that the DX system. All website content copyright ProtekCHM. Simple theme. Powered by Blogger.